Size of each die: 40mm x 84mm approx. 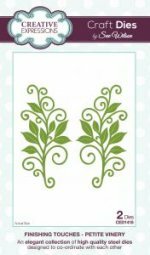 Petite Vinery: A lovely and elegant swirly vine for adding just the right touch to any card or scrapbook page. There is a right and left facing vine so they can be used anywhere on your card. 723250 One World, Fine Designs Collection (5x7) LIMITED EDITION!